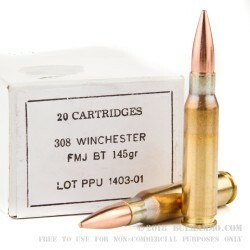 Extremely high quality and cheap price for a match capable .308 Winchester loadout. The Prvi Partizan Boat Tail Full Metal Jacket round is cased in incredibly high quality brass, with a Boxer primer, and represents a fantastic value for anyone who wants near match quality in a price point that is better than most imported sub-par “value” ammo. This is legitimate bulk .308 ammunition, offering exceptional accuracy out of gas driven, bolt action or direct impingement. The reliability is exceptional as well, with the high quality brass, consistent primers and projectiles and absolute consistency of the quality control process. The velocity is 2835 feet per second out of the bore and the muzzle energy of 2585 ft. lbs. means this is a very reasonable round that has accuracy out past 600 yards. You can find ammunition as accurate and as reliable as this ammunition, but you won’t be able to find it for anywhere near the price of this ammunition produced by Serbian manufacturer Prvi Partizan, who has more than 90 years of experience making ammunition. Suitable for use in all firearms chambered in .308 Winchester, but particularly well suited for gas driven rifles that can benefit from enhanced accuracy and consistent reliability. I've tested this along with all the other common .308 - PMC, fed .308, fed M-80, Win M-80, and HXP M-80. It beats PMC and Fed .308 at 550yds, its equal to HXP, Fed M-80 and Win M-80. Seeing as HXP isnt available anymore, it is now king of Bang for the Buck. A: You bet Brian. While there are some restrictions on magazines, we can ship 308 ammunition to California in whatever quantity you would like to order, provided we have that amount in stock. Q: can this be fired in my m1a and my rem. 700 as well. Posted On: 3/8/12 By: mark t.
A: Yes, this Prvi Partizan .308 ammo is a good choice for a Springfield M1A as well as a Remington 700. Q: Will the projectial attract a magnet? A: No, the projectile used in this Prvi Partizan .308 Win ammo will not attract a magnet. 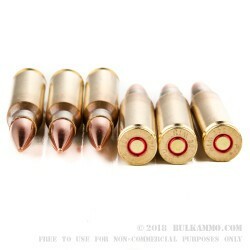 Q: Are these lead filled bullets or steel? 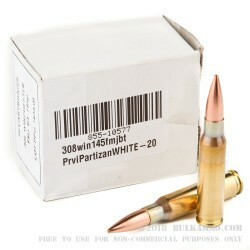 A: This Prvi Partizan .308 Win ammo has a lead core projectile with a copper jacket. Q: Does it have corrosive primers? A: No, this Prvi Partizan 308 ammo is loaded with non-corrosive primers. 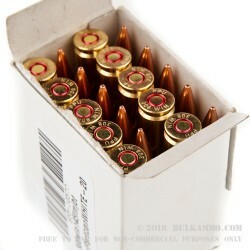 It is new production, high quality ammo. Q: These are new rounds, correct? Not reloads. A: This Prvi Partizan 7.62x51 ammo is new, produced at the Prvi factory in Serbia with all new components.